GRANNIES!!!!!!!!!! This is how Julie Holetz and I have felt lately talking about granny squares. Julie and I are working on a new project: A small book of granny square and granny inspired projects that will have you running for your hooks and your scraps of yarn. What is it about grannies that are so appealing? Maybe it’s because they’re small, self-contained and take only a few minutes to make each one. They allow you to play with color. “Grantastic” by ChocolateGirl64 on Flickr CC, some rights reserved. We’ve been brainstorming and coming up with ideas and trying to limit ourselves because the possibilities are endless. So I’ve been thinking a lot about how granny squares are designed and I thought I’d share a bit of my process here. First the important bit: Granny Squares are not *really* squares. 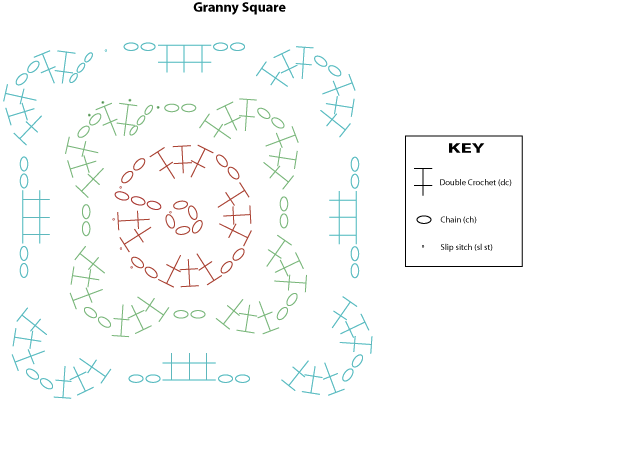 When you’re making a granny square, you’re working in the round and your artfully placed chain spaces determine the ultimate shape of the thing. (Note in the photo above, that the first two rounds are, indeed, round, but the ultimate motif is square). You can design your own granny squares! You just need to be consistent. Just like when you’re working a hat in the round, making a granny square involves using a consistent number of increases. In a traditional granny square, like the one in the chart below, there are 20 new stitches per round. So, if you wanted to play around with the look of the square–you could alter the arrangement of the stitches and chain spaces as long as you kept the number of stitches and the rate of increase consistent. The way they get to square is by concentrating the increases in the corners in the final few rounds. I love how this one by KnittyCent turns the square on its side, then back again. Julie is working on a great post about planning the arrangement of your squares in a project. Stay tuned to the Skamama blog to see it.